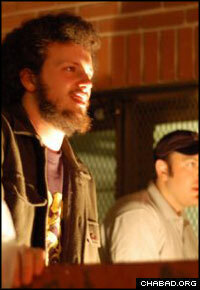 The Yood Power Rock Trio made their American debut at the University of Washington Chabad House in the spring of 2007. It isn't unusual for a late-night concert at a university to draw the attention of local law enforcement, so Rabbi Elie Estrin wasn’t too concerned when two police officers came up to him to ask when the Saturday night concert at his University of Washington-based Chabad House would be ending. After all, things would be wrapping up in 15 minutes, early for the Seattle school’s Frat Row. Estrin, though, quickly realized that the inquiry wasn’t routine: The two policemen, their shift coming to a close, had simply wanted to know how much longer they had to enjoy Israel’s latest rock sensation, the Yood Power Rock Trio. Like so many others who had walked past the bash on Estrin’s front lawn, the officers were mesmerized by the blend of classic rock sounds, heavily tinted with blues and the occasional country influence, combined with soul-searching lyrics. The band’s recognition among Israel’s music scene, however, is a little more deep. Band members Lazer Lloyd (guitar, vocals, harmonica) and Yaakov Lefcoe (bass, vocals) formed Yood with drummer Akiva Girsh in the fall of 2005, just after the Israeli government expelled its citizens from the Gaza Strip. At the time, says Lloyd, “we just knew that we needed to do something to counteract what was going on in the country. Music has a way of bringing people together. For three years, the band has found success in an unusually diverse list of settings. In 2006, Girsh left Yood for other pursuits and drummer Moshe Yankovsky signed on. Since then, the three has played before a crowd of 10,000 at Israel’s Dead Sea Festival and before more than 30,000 people at the Israel Day Parade in New York. Yood also has the distinction of being the only band to have ever been invited back to the parade for two consecutive years. Estrin, who’s work with students frequently puts him in contact with their musical tastes, says he’s not surprised by Yood’s growing success. The Seattle performance drew a lot of attention along the University of Washington’s Frat Row. Though their long-flowing beards leads audience members to draw comparisons to ZZ Top, the trio’s sound invokes such legends as Cream, Led Zeppelin and Jimi Hendrix. Still, the band vigorously avoids categorization, its members preferring to just play from the heart. For the most part, Yood’s songs are inspired by Chassidic teachings. “Set My Soul Free,” one of their most popular tracks, tells of the yearning of the Divine soul to break free from the constraints of the animal soul. Each of their albums also feature a traditional nigun, or traditional Chasidic melody. After getting to know the band’s members, fans are usually more impressed, say people who work with Yood. At stops on their recent two-week campus tour, students got to interact with the trio; the band also keeps in touch by e-mail. Yankovsky, a native Russian speaker who now lives in Rechovot, Israel, enjoys being able to reach out to other Russian-speaking Jews wherever the band plays. Lefcoe, who is currently finishing his Ph.D. in clinical psychology, has for years taught classes on Torah and psychology, and is focusing his doctoral research on topics connected to Jewish meditation. Lloyd is a professionally-trained musician who toured internationally with Reva L’Sheva and other bands.